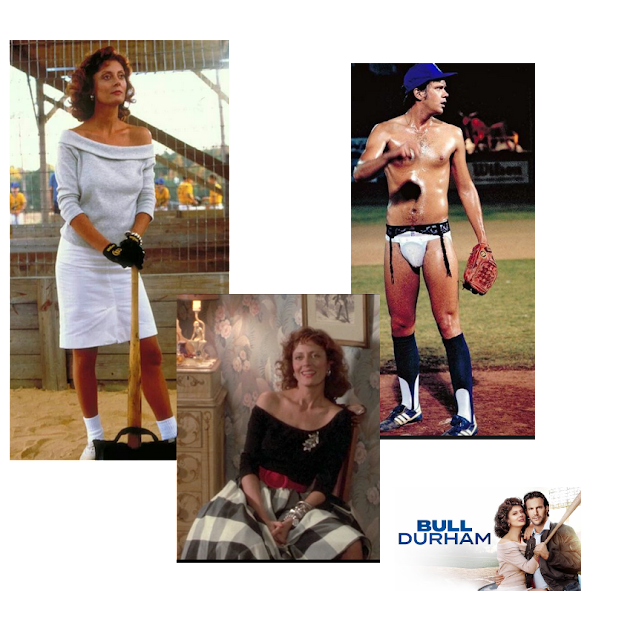 Bull Durham, the movie 1988 - (how could it be that long?) is memorable in several aspects. It was a good sports story, well acted and had stars that were easy on the eyes. Susan Sarandon was at the top of her game (pun intended) and dressed the part throughout the movie. The white, off the shoulder, dress shown above and the black and white check skirt were winners. Also, Kevin Costner encouraged the young and coming ballplayer, Tim Robbins, to wear garters and hose to work on his pitching skills. Loved it. The garter belt scene is hilarious and the sexual chemistry between all three of the main characters is great throughout the movie. What made me think of this movie tonight is that the restaurant where I had dinner was packed with spring training fans and ball players. Florida has always been a major training site for the start of the Major League Baseball season and West Palm has always hosted sever camps. One stadium in West Palm host the Houston Astros and Washington Nationals teams. In Jupiter where I live, we host spring training for the Miami Marlins and St. Louis Cardinals. This time of year we are inundated with fans and teams for the approximately six weeks of spring training. Several exhibition games daily within a few miles of each other. If you are a baseball fan, come and join the fun. If you are still in the snowy north, put this movie into the "VCR", (remember those) and enjoy a good sports movie. And the outfits are pretty good as well. An excellent film , indeed !